Scientists on Wednesday described the cranium of a small primitive Cretaceous Period mammal called Cifelliodon wahkarmoosuch, about the size of a small hare, that lived 130 million years ago, boasting traits suggesting it possessed a keen sense of smell and may have been nocturnal. The three-inch (7.5-cm) skull was well preserved and nearly complete, unlike the usual scrappy fossils of the group to which Cifelliodon belonged, called haramiyidans. 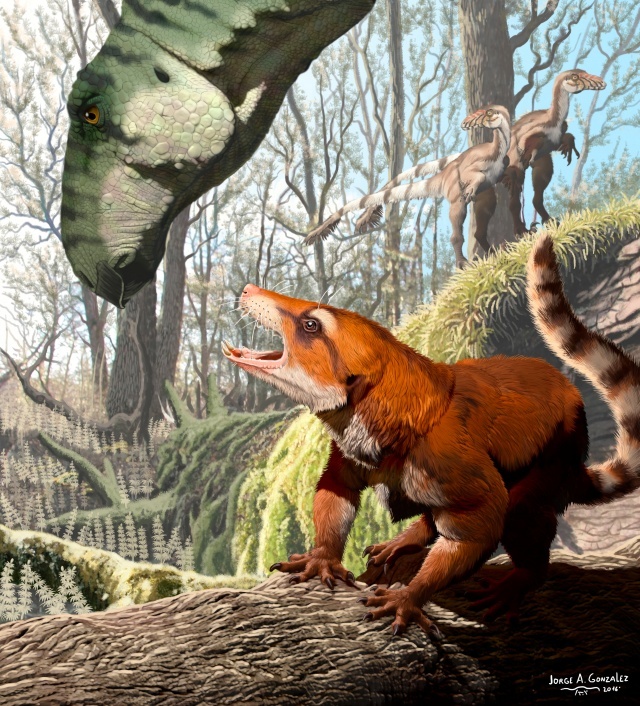 The earliest primitive mammals evolved during the Triassic Period, when dinosaurs also first appeared, from creatures that combined reptilian and mammalian characteristics. Haramiyidans appeared close to the dawn of the mammalian lineage, with the earliest-known representative living about 208 million years ago and the last-known member perhaps about 70 million years ago. The skull was unwittingly excavated at a site north of Arches National Park in eastern Utah. The palaeontologists from Utah Geological Survey did not know it was entombed in rock brought back to a lab for study until they looked under a foot bone of a two-legged plant-eating dinosaur called Hippodraco. It may be the best-preserved skull of any haramiyidan, offering a new understanding of the group. “Compared to modern mammals, Cifelliodon had a simple, tube-like brain, lacked complex bony structures usually associated with the front part of the brain case and nasal region, and had simple tooth roots, among other primitive features,” University of Southern California palaeontologist Adam Huttenlocker said. Before a geological process called plate tectonics rendered them separate land masses, the Americas, Eurasia, Africa, Antarctica, Australia and India all were part of a huge, single continent called Pangaea. The timing for Pangaea’s breakup, initially into two major land masses, has been a matter of scientific debate. The researchers said the discovery of Cifelliodon, which had a close contemporaneous relative in Africa, suggests there were still connections between the northern hemisphere continents and those in the southern hemisphere 15 million years later than previously believed.